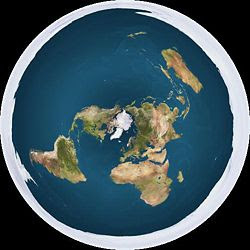 keith's ramblings: The earth is flat! During the run up to Keith's Ramblings 5th anniversary, I'm picking a piece from the archives each day. Apparently I wrote this one on January 2nd 2008 although I have to admit I have absolutely no recollection of doing so! Maybe the New Year celebrations were going on a bit! I love alternative theories! I remain to be convinced that man landed on the moon. I am pretty sure it wasn’t the Titanic that sank, rather its sister ship the RMS Olympic. And Santa is an anagram of Satan, so is he really the jolly chap we all think he is or the devil in disguise?How about this one. The Earth is a flat disc, not a sphere! Don’t laugh! It’s possible. It has a diameter of 24,0h0 miles with a 150 foot wall of ice around the edge and the ‘north’ pole at the centre! It gets better. The sun and moon are also discs, 32 miles in diameter and only 3000 miles above us. The stars are 100 miles above them. As for gravity, this is brought about as a result of the Earth accelerating upwards. This also explains global warming as we are gradually getting closer and closer to the sun which itself is moving upwards, but at a slightly slower pace than us. The oceans' tides? Simple. The Earth tips from side to side causing the water to slosh to one side then the other. I’m told that sunrise and sunset come about as a result of the planetary bodies above us revolving and moving in and out, although I’m not sure I quite understand that one! Now I didn’t invent all this stuff myself! There is a Flat Earth Society which puts up very convincing arguments for this theory. And I like it! I was thinking that a new business could be started up which offers the ultimate bungee jump from the edge of the earth! And instead of rock-climbing a whole new dangerous sport could start by crossing the earth from underneath using giant suckers! Anyway, I have to sign off now or I’ll be late for my appointment with my counsellor!